Miriam and Aaron spoke against Moses because of the Cushite woman whom he had married, for he had married a Cushite woman; and they said, "Has the LORD indeed spoken only through Moses? Has he not spoken through us also?" And the LORD heard it.... And the anger of the LORD was kindled against them, and he departed; and when the cloud removed from over the tent, behold, Miriam was leprous, as white as snow. And Aaron turned towards Miriam, and behold, she was leprous. "Bishops, priests and deacons are too often weak and sinful. They need to be held to high standards. Some deserve to be chastised." These words were spoken by Archbishop Chaput in his opening homily to the Knights of Columbus convention in Denver on August 2. He had this to say to the dissenters within the Church, "The church belongs to Jesus Christ, and the different roles within the Christian community – clergy, laity and religious life – have equal dignity but different purposes. When people deride their bishops and priests out of pride and resentment or some perverse desire for what they perceive as “power,” they undermine the Church herself." And then he adds, "Renewal begins not in vilifying others, but in examining ourselves honestly, repenting of our own sins and changing ourselves.... When we really understand that, we can speak to each other with both honesty and love, and restoring the mission of the Church can begin." I have a public confession to make. I certainly have been guilty of "chastising" the bishops of New York -- and Archbishop Dolan in particular -- with regards to their failure to strongly defend marriage. I hope that I have not gone to the level of "vilifying", although it is a thin line. I hope that what I have done is to "hold the bishops to high standards". At least that has always been my intent. I certainly have no "desire for power" nor do I seek to "undermine the Church". On the contrary, I would simply like to see the Church leadership uphold the teachings that have been handed down to us. Archbishop Chaput himself uses very strong words earlier in his homily to condemn Aaron, the brother of Moses. He calls him "spineless" because he "went along with the Golden Calf" and he supported his sister Miriam in her rebellion against Moses, which the Archbishop interprets as a rebellion against God and His Church. Given that Aaron was a High Priest of the People of Israel, it seems that the Archbishop is also indicating that those in leadership positions in today's Church who fail in their defense of the Church's teachings are equally "portraits of male spinelessness". The Archbishop concludes with an urgent call for renewal within the Church, "God is calling each of us here today – clergy, lay and religious – to love him with all our hearts and to renew the life of his Church. God is calling us now. Tomorrow will be too late." The dynamic in the family of Moses is not so different from the dynamic in the family of today’s Church. God has chosen Moses to lead his people. Miriam and Aaron, the sister and brother of Moses, resent his taking of a Cushite wife. But the disputed marriage is merely a pretext for the siblings. What they really resent is Moses’ elevation above themselves, his special relationship with God. Moses is very much a flawed human being. By this point in Scripture he may be “meek,” but he is not without sin. Nonetheless he is chosen by God. Therefore, Miriam’s and Aaron’s criticism – which flows out of their own rebellious pride – is really a criticism of God himself. Miriam, as the instigator, is struck with leprosy, but at least there is a kind of negative dignity to her willfulness. Aaron is almost worse; a portrait of male spinelessness. This is the man who went along with the Golden Calf. Now he goes along with Miriam, and when Miriam is punished, he becomes obsequious with Moses. Something similar can be said about conflicts in the Modern Church. Bishops, priests and deacons are too often weak and sinful. They need to be held to high standards. Some deserve to be chastised. The clergy’s leadership in the Church should always be marked by humility and service, and never by a sense of entitlement. But men and women didn’t found the Church; they don’t own her; and they have no license to reinvent her. 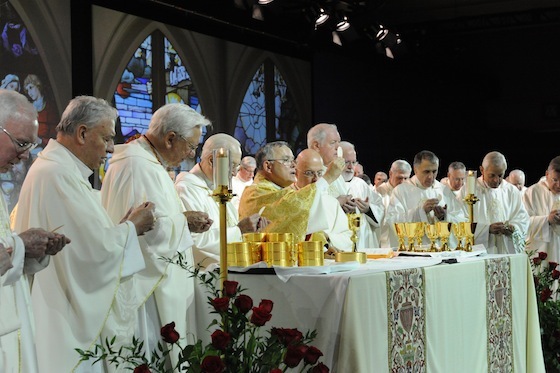 The church belongs to Jesus Christ, and the different roles within the Christian community – clergy, laity and religious life – have equal dignity but different purposes. Sin and failure, including by the clergy, need to be named. But when people deride their bishops and priests out of pride and resentment or some perverse desire for what they perceive as “power,” they undermine the Church herself, and they set themselves against the God whose vessel she is. And that, as Scripture suggests, leads in a painful direction. All real reform in the Church requires two things. Today’s Responsorial Psalm – Psalm 51 – gives us the first thing. We find it in the lines “Purge me with hyssop, and I shall be clean; wash me, and I will be whiter than snow;” and “Create in me a clean heart, O God, and put a new and right spirit within me.” Renewal begins not in vilifying others, but in examining ourselves honestly, repenting of our own sins and changing ourselves. This applies to every baptized person, from the Pope to the average man or woman earning a wage. We are all sinners. We are all in need of repentance and God’s mercy. When we really understand that, we can speak to each other with both honesty and love, and restoring the mission of the Church can begin. Today’s Gospel gives us the second thing needed for any lasting Church reform: faith. Not faith as theology, or faith a collection of doctrines and practices; but faith as a single-minded confidence in God; faith as the humility – and in a sense, the imprudence the passion, the recklessness – to give ourselves entirely to Jesus Christ. That kind of faith changes people. That kind of faith shifts the world on its axis, because nothing can stand against it. As long as Peter keeps his eyes and his heart fixed on Jesus Christ, he can do the impossible – he can walk on the water. The moment he gives in to doubt and fear, he begins to sink. So it is with our personal faith, and so it is with life and health of the Church. In light of our Gospel reading, it’s fitting that our Mass today commemorates the French priest and saint from the 19th century, Peter Eymand. Eymand was a friend of Sts. Peter Chanel and Jean-Marie Vianney, and the founder of the Congregation of the Blessed Sacrament. He was an intriguing man. The great French sculptor, Auguste Rodin, once entered Eymand’s congregation as a lay brother, having given up art after the death of his sister. Eymand served as Rodin’s spiritual counselor, and eventually sent him back to his work in the world as a sculptor, because he believed that Rodin glorified God more truly through the beauty of his art. The focus of Eymand’s life was an intense love of Jesus Christ in the Blessed Sacrament. He was tireless in preaching a deep devotion to the Eucharist as a key to reigniting the vocation of Christians in the world. The Church honors him as “the Apostle of the Eucharist,” and his most famous line is worth remembering. When he decided to leave the diocesan clergy to become a religious priest, his sisters begged him to wait and reflect just a little longer before he acted – even just one more day. He answered, “God calls me now. Tomorrow will be too late.” God is calling each of us here today – clergy, lay and religious – to love him with all our hearts and to renew the life of his Church. God is calling us now. Tomorrow will be too late. So let’s pray for each other, and support each other – and begin. Michael, I do not think you are undermining the Church at all by pointing out flaws in Abp. Dolan's approach to defending marriage. In fact, being unequivocally clear and uncompromising about the teachings of the Church is the bare minimum needed to protect it today. The whole Humanae Vitae affair, which extended over many months in 1968 and after, very quickly established quite firmly in the minds of most people the proposition that the Magisterium of the Church could err; the pope and the bishops might reaffirm the Church's traditional teaching as solemnly as they liked, but they were nevertheless widely seen as simply being wrong about birth control. And if the Church's Magisterium could be in error concerning a matter taught as long and consistently as the Church's teaching condemning contraception, then the same Magisterium could surely be in error concerning other teachings, even those that the Magisterium might nevertheless continue to insist on. The underlying logic of the situation escaped very few people. If the Church was wrong, dissent was not only permitted—it was imperative. It was on this basis that dissent quickly came to be nearly universal, in fact. In the minds of very many people, the dissenting theologians, not the pope and the bishops, had turned out to be right on the issue. Moreover, since most of the dissenting theologians continued to remain in place, and **were neither removed nor rebuked by Church authority for their open dissent**, the other thought that inevitably came to be lodged in people's minds was this: maybe the Church herself really had doubts about the teaching in the final analysis; surely Church authorities could not really be very serious about the birth control teaching, in spite of their verbal reaffirmations of its authenticity. Otherwise, how could all these open dissenters simply be left in place to go on publicly contradicting and undermining the teaching Church, as was the case? Hence, the need to excommunicate and deny Holy Communion to these anti-life politicians and other dissenters. St Dominic, splendor of the priesthood, pray for us! I wonder not only about whether some Church leaders really are in agreement with the teachings of the Church on moral issues, but whether they actually believe that Jesus Christ is the Son of God. Do they really believe that Christ walked on water? Or have they come to the "scientific" conclusion that this is impossible? In other words, have they lost their faith in God? I suppose one can still have a weak belief in God without the true faith that "with God all things are possible." Thanks be to God for Pope Benedict XVI! ¡Viva El Papa! M. I was so captivated by the article you quoted that I forgot to say thank you! It was written in 1999. Approximately 30 years after Humanae Vitae. This article is a very careful analysis of the response of the US Bishops to Humanae Vitae. It concludes that the letter "Human Life in Our Day" which superficially supports the Pope, is actually an "invitation to rebellion" within the Church ranks. My own opinion is that what we can see in documents like this from the American Bishops is a Church that is torn from within by different factions. The documents represent "compromises" between the warring factions. That is why they speak with such a weak and incoherent voice. There should be no "compromise" on the fundamental truth of Church teachings. It is no exaggeration to say that, by 1987, this theological dissent already had become "institutionalized," at least in practice, in the Church in the United States. And responsibility for this state of affairs, at least in part, must be laid at the door of the 1968 Pastoral Letter [from the US Bishops Conference] "Human Life in Our Day". How could a bishops' Pastoral Letter which so strongly affirmed and supported Pope Paul VI's Humanae Vitae be in any way responsible for helping to "institutionalize" theological dissent in the Church in the United States? Surely the intention of the bishops was to defend and justify the pope's position, not permit dissent from it. Yes, but the bishops unfortunately went somewhat beyond merely endorsing the pope's position. They evidently thought that they had to reach out to and accommodate in some fashion the large numbers of those working within the Church's official teaching and educational structure who turned out to be open dissenters from the pope's encyclical. They accordingly included in their Pastoral Letter a short chapter entitled "Norms of Licit Theological Dissent." If anything, it has been those who have attempted to call attention to the deleterious effects of dissent who have been the ones most readily criticized; often they have been marginalized for insisting on the Church's authentic teaching. This is the state of affairs that has roughly obtained in the Church in the United States from 1968 up until the present day. And it has often been justified—and, in one sense, even made possible—by the presence of the "Norms of Licit Dissent" in the Pastoral Letter of the U.S. bishops' Human Life in Our Day. Merely to characterize dissent as ever possibly "licit" was perhaps already to give the game away; once this point was conceded, it inevitably became merely a question of what specific cases of dissent were therefore "licit." By admitting that dissent could ever be licit, the bishops simply invited dissenters in all cases to assert that their particular dissent was licit. Any bishop even contemplating disciplining or removing a dissenter henceforth had to admit the plea that the dissent of the latter was, after all, at least arguably licit, according to the bishops' own criteria. In practice, virtually all dissent was thereby enabled to be considered licit. You're welcome. :) I was glad to have stumbled on it while doing random google searches.